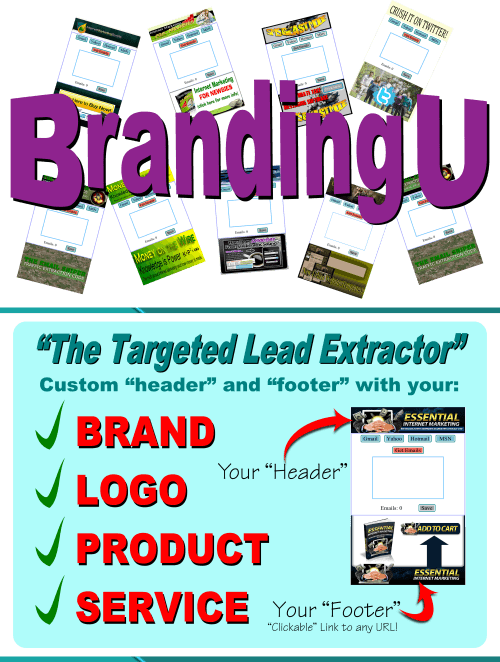 Branding U Software is a collection of Lead Generation tools that can be re-branded to you or your company's specific brand or offer. Once re-branded, you can use it as a lead magnet, sell it or give it away. You OWN it. Re-Branded Software gives you the look and feel as if you owned the actual software which YOU DO. Professionals in Network Marketing have found this to be a very useful tool in having a specific brand on our software to offer to people in their down lines to aid in the effort of lead generation. In all cases, the software can have a URL link to any offer or promotion. 3) URL: The exact URL that you want the footer image to point to. *Extra art charges may apply if "camera ready" art work is not supplied. **No refunds will be made once the completed Targeted Lead Extractor software has been delivered. Once we receive your information, we go to work and customize the software to your brand and inject your URL so that it will point to your; Website, CPA offer, MLM Site, Affiliate Offer, Mobile Opt-In Page or any other web based site. Terms and Conditions: I am making this offer to you, business to business. If you decide to purchase your branded version of the Targeted Lead Extractor, I promise to work closely with you ensuring your software will be branded and delivered in a timely manner. If you have any questions prior to making your purchase, please feel free to contact me directly! We go the extra mile to make sure that you are completely satisfied.